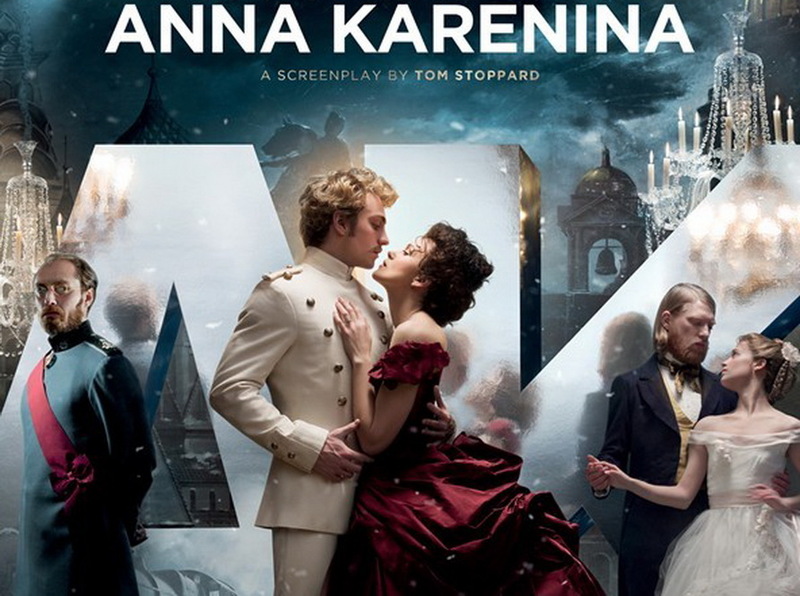 “All the world’s a stage” according to the Bard; and it remains true for Russian high society in the new Joe Wright adaptation of Anna Karenina. With the rise of auteurs adapting classic literature with insightful new commentary (see also: Wuthering Heights, Dangerous Liaisons), Wright adds creative commentary to imperialist Russia while adapting the classic story. The film takes place almost exclusively inside a decaying theatre, with society members watching from their seats as various dramas occur on and off stage. The drama, of course, is centered on Anna Karenina (Wright’s muse Keira Knightley) and her illicit affair with Vronsky (Aaron Taylor-Johnson) that shocked the nation. 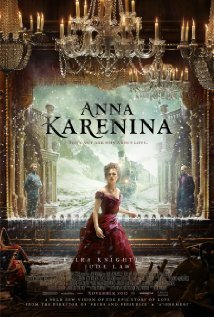 Bored with her cold, aging husband, Karenin (Jude Law), Anna becomes immediately enraptured with Vronsky’s youthful beauty. She ironically falls for him while on a trip to save her brother Stiva’s (a deeply unattractive Matthew Macfadyen) marriage to Dolly (Kelly Macdonald), after she, Dolly, learns of Stiva’s affair with the governess. If there is a biological gene that predisposes one to cheat, then the Oblonsky family—Anna and Stiva—certainly has it. Anna’s passion for Vronsky isn’t one-sided. He quickly ditches young Kitty (Alicia Vikander) right before he is intended to propose to her, so he can chase after Anna. Poor Kitty is devastated, having just spurned her other suitor, Levin (Domhnall Gleeson), in anticipation of Vronsky’s proposal. Passionate love is a dangerous thing in the world of Anna Karenina. Because it is 1874 Russia, divorce is still a relatively new and shameful thing. Fearful of being shamed by society and losing custody of her beloved son, Seryozha (Oskar McNamara), Anna tries to keep her affair secret from Karenin. But her unbridled passion for Vronsky makes her the center of gossip in Moscow. When she discovers that she’s pregnant with Vronsky’s child, Anna must confess all to Karenin and place herself at his mercy. Keira Knightley does a masterful job of expressing her passionate love, while still attempting to keep it in check. And for the scenes when Anna slowly loses her mind, Knightley plays them perfectly. We can see in her eyes all the turmoil that author Leo Tolstoy wrote in the novel. In the book it is far easier to get into the characters’ minds because Tolstoy writes their thoughts, but Wright has put together a very capable cast. Taylor-Johnson captures the naiveté (and beauty) of Vronsky, while still making him a compelling character. Jude Law, too, manages to make Karenin a sympathetic character. The screenplay, by playwright Tom Stoppard, focuses solely on Tolstoy’s exploration of love. Stoppard cut out the duller parts of the novel, mostly involving Levin’s farm life, allowing Anna’s story to fully take over. (In the novel, Levin gets far more page time, despite the book’s title.) Stoppard does a superb job of drawing out the major themes of the novel, yet the true beauty of the film lies in its stunning visuals. The production design by Sarah Greenwood is ornately beautiful and intricately complex. As characters walk from room to room, the walls (or stage sets) smoothly transition into each new room. The costumes by Jacqueline Durran embody the decadence of the time period. And Seamus McGarvey’s cinematography captures all the elegance of these elements in the film. With Dario Marianelli’s Russified score perfectly matching the mood and pace, the film threatens to overload the senses. Fortunately, the editor (Melanie Oliver) knows when to tone it down—for the intimate, dramatic scenes—and when to turn it up—for the scandalous society scenes. Not everyone will be as taken with Anna Karenina as I—pomp and circumstance aren’t for everyone. But the film’s examination of unhappy families will make you rethink your concept of relationships. And whether you love or hate the film, Tolstoy’s novel is truly a must read for everyone (I recommend the lauded translation by Richard Pevear and Larissa Volokhonsky).